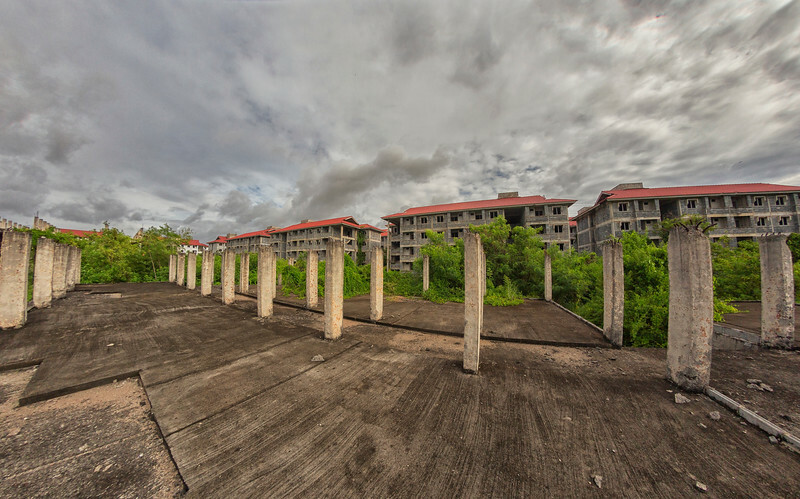 This is an abandoned apartment complex in Samut Prakarn, to the southeast of Bangkok, which occupies an immense property not far from Suvarnabhumi International Airport. It seems that construction was abandoned on the facility sometime around the '97 financial crisis. There are numerous individual buildings which hold a number of apartments, the building of many of the units seems to have been completed, while several others are only concrete foundations. Nature has wasted no time in reclaiming the land, with thick green foliage and marshy wetness overtaking much of the site. The rainy, cloudy skies combined with the lush green foliage, multi-colored flowers, and random bits of colorful debris left behind by workers and squatters made for some strong images & I'm certainly glad I took the time to drive out here on a Sunday morning.